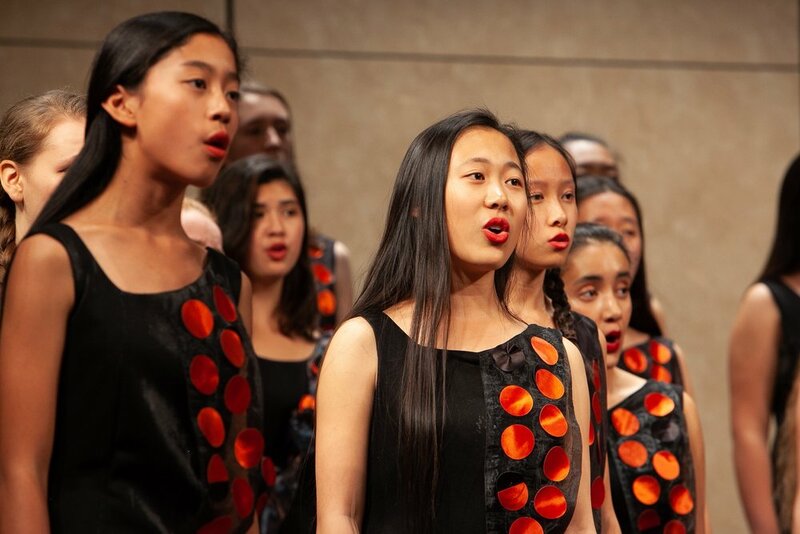 Over the course of its 40-year history, the San Francisco Girls Chorus has enjoyed collaborative partnerships with a variety of leading arts organization - from the Philip Glass Ensemble to the San Francisco Ballet to the San Francisco Film Festival. Central to SFGC’s philosophy behind these collaborations is the belief that mixing musical genres and art forms not only presents a unique learning experience for SFGC’s choristers but creates truly extraordinary art. For the 2018-2019 season, on the occasion of SFGC’s 40th anniversary, the Chorus has added a new dimension to its rich history of cross-form collaborations with the launch of a new partnership with leading San Francisco fashion designer and art impresario Yuka Uehara. Widely regarded as one of the most talented young entrepreneurs and fashion designers of her generation, Uehara’s Tokyo Gamine has taken the San Francisco fashion scene by storm. Her outfits have been featured on concert stages for performances, and on the red carpet for major fundraising galas, for some of the city’s leading cultural institutions, including the San Francisco Symphony, San Francisco Opera, and San Francisco Ballet. Uehara’s remarkably elegant yet contemporary, sophisticated style is unmistakable. Every garment she creates tells a story and exudes life, energy, and passion. For this partnership, Uehara has created a new pair of concert outfits – a dress and pantsuit – for SFGC’s Premier Ensemble. Reflecting Uehara’s trendy style as well as influences from SFGC’s 40-year history and season programming, the outfits are designed to be worn together and debuted for the opening concert of SFGC’s San Francisco subscription series on Thursday, October 18, 2018, at Herbst Theatre. These outfits will be the exclusive garments worn by the Premier Ensemble for all of its public performances in the Bay Area this season and for its July 2019 international tour to England and France. The outfits similarly feature a sleek, contemporary black base garment that is adorned with removable embellishments created by Uehara from an original painting inspired by the power, beauty, and virtuosity of SFGC’s young women and the specific musical works featured on SFGC’s 2018–2019 Season. Each season, Uehara will paint a new work based on the season’s themes and concert programs that will again be transferred to fabric and used to create new embellishments. The partnership is not limited to just the concert outfits, however. SFGC has also created a limited edition tote bag, produced exclusively for the Chorus by San Francisco-based Rickshaw Bagworks, which features a recent Uehara painting and will be available for purchase at concerts. All proceeds from tote bag sales will benefit SFGC’s Need-Based Scholarship Fund. SFGC will also feature a collection of Uehara’s paintings through it home, the Kanbar Performing Arts Center.